Thanks to the new members that joined recently. Thanks to James Sterman, Michael Weiss, Adam Taylor, Keith Erb, Joseph Pilart, Lawrence Sobczak, Tom Joseph and the other contributors to this issue! Also many thanks to in the message board and Facebook group on their continuing technical help to our members on our message board and Facebook Group at www.facebook.com/groups/firebirdclub. Special thanks to Mark Neumann who is now helping us with copy editing and proof reading the EAGLE. We once again have all sizes of polo/golf shirts (L, XL & XXL) back in stock. Available from the club store in this issue or online at the club’s website. 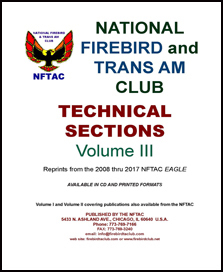 I am pleased to announce that we have now published NFTAC Technical Sections Volume III which contains sections, topics, questions and answers published in the Eagle from 2008 to 2017. It is available in printed and CD formats and can also be emailed. Various tech section combos are also available in the club store. All of the tech sections are indexed by category such as electrical, suspension, etc. for easy reference and accessibility. A result of the full color Eagle magazine is that we are now able to offer free classified ads to members that now include one color photo and contain 50 words. This is because we no longer have a restriction on the pages that ad photos can be placed on. We have now issued plastic membership cards to all members. All current members should have already received the new plastic membership card. Please let us know if you are a current member that has not received the new membership card. As the new membership card is plastic it is meant to be permanent and will no longer include your membership expiration date. Your membership number and membership expiration date can always found on the label on each issue of the printed EAGLE and other club mailings. You can always call, email or text us if you ever need a replacement card, your membership number or your expiration date. We have expanded our list of free items that members can receive with 3 year membership or renewal. You can now receive either a free t-shirt, a tech CD (or emailed) or past issues of the Eagle in pdf format on CD (or emailed). We offer a 3 year membership or renewal rate for $95 or $125 for members outside the USA. We also have a 3 year eMembership for $65 which also includes the free items. Save money and get a t-shirt or tech sections on CD (or emailed) or Eagles on CD (emailed)! You can now find us on Facebook at www.facebook.com/groups/firebirdclub and twitter in the groups/clubs section. Our Facebook group now has over 7,000 members. The Facebook group is quite large and is adding hundreds of members each month. Join now for lively discussions of your favorite cars. We have a club message board. You can access it through the club website at www.firebirdtaclub.com or directly at https://board.firebirdtaclub.com . We have a members only section of the message board. The club has a blog located at https://blog.firebirdtaclub.com . The Club photo gallery is located at https://photos.firebirdtaclub.com . The website has a "Members Only" section on the website. This section contains technical staff contact information, recommended repair shops, spare parts lists that members have sent in as well as complete current and past issues of the member magazine which can be viewed on-line or downloaded for printing. You can use the user id and password on page 3 of each Eagle or you can get a personal id and password. To do so, register and then login to the message board and send a message to us with a reply in this section or via email. This allows you to access the Members Only section of the website and allows you to post items in the For Sale and Wanted sections of the Message Board as well as post photos in the Club Photo Gallery. Classified ads are FREE to members and now include up to 50 words and one photograph of your car or item. Also the classified ads will now appear on our website and in the eEagle. Remember we will send out the eEagle, our email newsletter in addition to the regular Eagle for members that have given us their email address. Our website address is www.firebirdtaclub.com and our email address is info@firebirdtaclub.com . Classified ads will now appear in the Eagle, the eEagle, on our website, on our message board and on Facebook and Twitter. Thanks for all of your support and to this issue’s contributors. Have a great start to the show and driving season!! 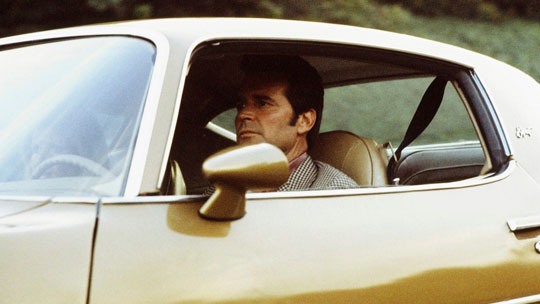 "This is Jim Rockford, leave your name and a message"…if you’d like to buy my car. 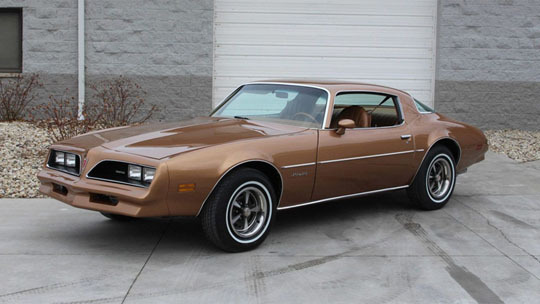 Or you can head to the Barrett-Jackson auction in Scottsdale, Ariz., on Saturday night to bid on a 1978 Pontiac Firebird Formula 400 that was not only used in the James Garner-led TV show, "The Rockford Files," but also owned by the actor himself. Six promotional/show cars were built by T/G Racing. There were all new showroom cars bought from Royal Pontiac in Los Angeles. According to Doug Innes, T/G Racing bought the six Trans Ams and took them to their shop at 18422 Topham Street, Tarzana for conversion. The cars were stripped of their interiors and insulation which was crated and stored. 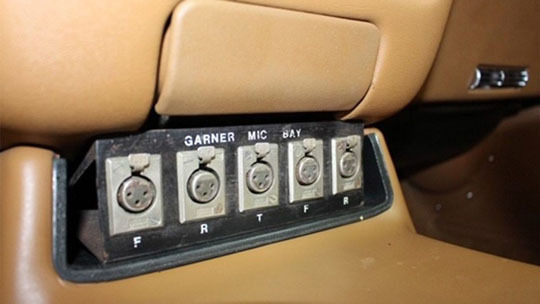 The interiors were included with each car when they were sold once the 12 month promotion was completed. T/G Racing installed a race seat, fire extinguisher, a mock fuel cell cover in the trunk and a fuel filler on the quarter panel. Lightweight tubing was installed as a roll cage . Mini Light wheels were installed - obviously with BFG Radial T/A’s were mounted on each mini light wheel. Hood pins and rear window bracing was also installed . The HO 455 engine & M21 4 speed transmission were not touched other than valve covers and dress-up were items added. On completion, the cars were sent across the alley to T/G’s other shop and Peter Dodge painted them all blue to match the #92 race car. The graphics were done all by hand based on a BFG design - which was brilliant . It is still one of the most recognized race cars ever! When complete, BFG picked up the cars and distributed them to their zones for promotional purposes. Most cars were used by dealers on their showroom floors to attract customers. At the conclusion of the racing season, the cars were either sold to the public or destroyed. To date, only two cars are known to have been sold. One in California and one in Ohio. Only the California car is still known to exist and here is its history. Trans Am and Firebirds were dramatically redesigned up front for 1977. The new fascia was comprised of a single piece of flexible Reaction Injected Molded urethane, which replaced the previous year’s separate Endura bumper and fiberglass header panel. Two rectangular headlamps for each side replaced the single round ones. Also, unlike the 1976 models, they were incorporated into the outer areas of the revised plastic recessed grilles that now included the headlamp bezels. A honeycomb pattern and a decorative chromed outer edge characterized all 1977 Trans Ams and Firebird grilles, but the inner colors varied with the model or specific appearance packages. Trans Am and Formula grilles were black in the honeycomb and surround areas. Black and gold Special Edition Trans Am grilles had gold liners, as did those used with black or white Formulas with the W50 Appearance Package in gold. Base Firebird and upscale Esprit grilles had silver liners and darker gray on the honeycomb. The W60 "Skybird" Appearance Package was offered on the Esprit, and it featured body-color Lombard Blue grille liners and the darker lower body blue on the honeycomb area. For 1978, the honeycomb grille pattern was replaced with a stylized diagonal crosshatch. Grille color differences for 1977 carried over for the model previously mentioned. With a revised nose, a W72 400 engine option that produced 200 h for 1977 and 220 hp for 1978, a boost from Hollywood care of the 1977’s Smokey and the Bandit, and a WS6 Special Performance Package suspension option for 1978, Trans Am sales continued to soar, as did those of the Firebirds. For 1979, the front and rear on Pontiac’s F-body were redesigned and yet another sales record was set. By 1980 and 1981 sales receded, likely due to anticipation of the upcoming third generation Firebird and Trans Am which were introduced for 1982. 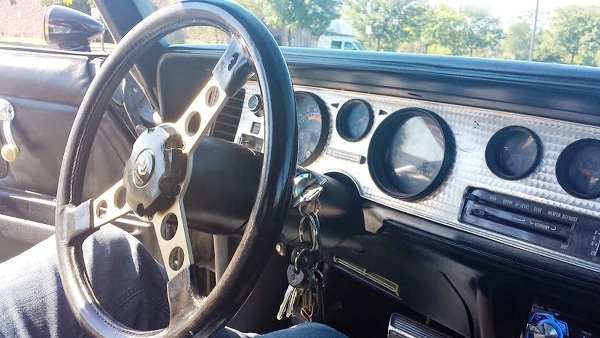 The late 1970s was a golden era for the Firebird and Trans Am, and even though they weren’t the fastest of the second generations, they are coveted by collectors today. Also while in Pontiac, Illinois I visited out printer, Johnson Press. This was my first opportunity to meet with the people I have been communicating by phone and email with and to see where our magazine has been printed since 2012. The visit concluded with a light lunch with Teresa and plant manager, Steve "Buzz" Zeller. Thanks again to everyone at Johnson Press of American for the welcome and the continued fine job done with our magazines! 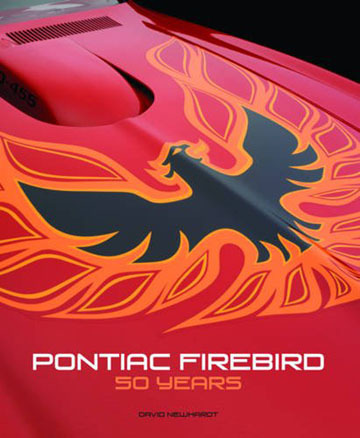 Pontiac Firebird: 50 Years chronicles the Firebird’s rich history, from the early attempts to reach the youth market in the early 1960s, through the potent and turbulent years of the classic muscle car era, the resurgence of muscle in the 1980s, to the car’s continued popularity today. In the mid-1960s, Ford Motor Company took the automotive world by storm with the release of its new "pony car," the Ford Mustang. It was the right car for the right time, and it caught General Motors by surprise. One year later, after seeing the Mustang’s enormous sales success, General Motors announced the development of its own pony-car platform, code-named "Panther," to compete with the tremendously popular Mustang. And what a competition it became. Chevrolet Camaros and Pontiac Firebirds hit the market as 1967 models, and the world clamored for more of these new Mustang killers. These F-Body cars became some of the most popular enthusiast cars of all time. Half a century later, racing fans still talk about the original Trans-Am series, which pitted top drivers competing in popular new sports sedans like the Ford Mustang and Chevrolet Camaro. 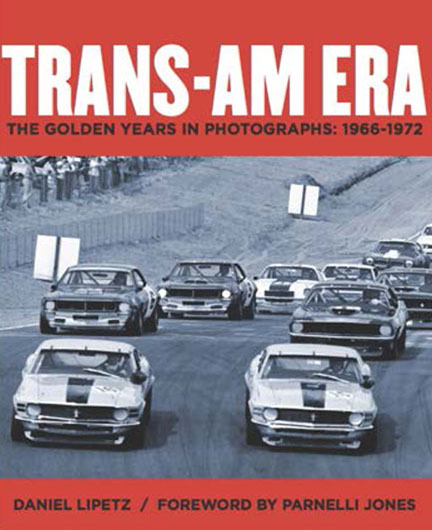 Trans-Am Era uses hundreds of vivid photographs to bring back the excitement of the Trans-Am on the track, in the pits, and behind the scenes. 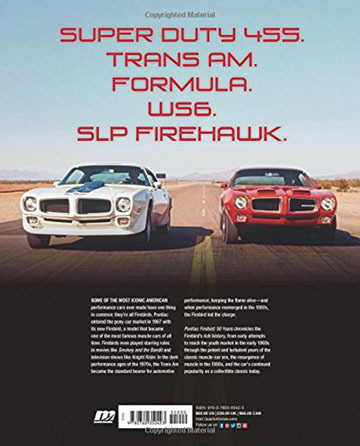 A limited edition of the most famous and beloved Firebird Trans Am is https://fochal.com/forms/fborder.htm! Yes, Pontiac produced the Trans Am from 1967 to 2002 but you can still go and buy a new Trans Am. 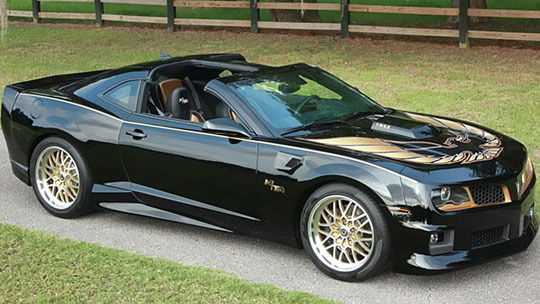 The company Trans Am Depot introduced a new, extremely limited, Trans Am SE Bandit Edition, based on the bones of the fifth-generation Chevrolet Camaro, inspired by the famous and unforgettable black and gold example that starred in 1977 hit movie "Smokey and the Bandit". They will produce 77 modern replicas, all signed by "Smokey and the Bandit" star Burt Reynolds. The Trans Am Depot model features all the details and elements painstakingly crafted to reminisce the original vehicle, paying more than a tribute to it. Of course, there’s also a big bird plastered on the hood. "The Shaker hood and T-tops were a must. If you don’t have the T-tops, you don’t have a Trans Am," said Scott Warmack, co-founder of the Trans Am Depot. The white-letter tires and snowflake wheels complete the retro effect. "It was hot in every way. It was a love story and most guys like a love story with a car in it," said Burt Reynolds. When a 1977 Trans Am used to promote the movie Smokey and the Bandit hammered for $550,000 at Barrett Jackson’s Scottsdale auction in January, news of the sale crackled across the Internet like a speed trap sighting over CB channel 19. While that particular car can be considered unusual for a number of reasons, it made us curious about where the prices of the ‘77 S. E. Trans Ams have been and where they might be heading. These cars have always been desirable and valuable. 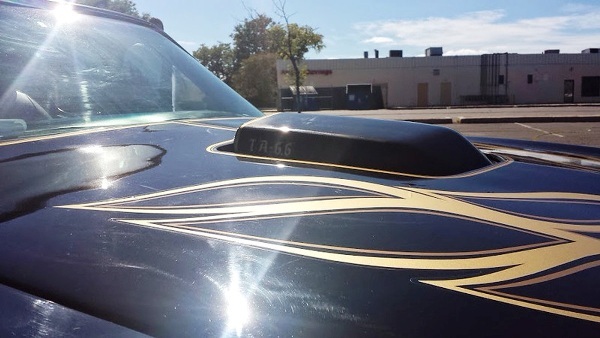 The 1977 Special Edition Trans Am wasn’t the first black Trans Am built with the gold bird on its hood but it was the car that made that logo legendary, with help from the on-screen antics of Burt Reynolds, Jackie Gleason, Sally Field, Jerry Reed and company. Almost any 1975-1981 Trans Am is worth owning as a collectible these days, but the cars patterned after the car featured in 1977’s second highest grossing film (Star Wars was number one at the box office) are among the hottest of any Firebird today. If you’re shopping for a 1977 Trans Am today, the good news is the car is plentiful enough that you can find a nice example in the $20,000 range and project cars for $8,000 and under -- way under in some cases. But, if you want the ultimate 1977 Trans Am -- a show-stopping SE with black interior, four speed, the 200 hp 400, a CB radio, etc. -- you’d better be prepared to spend upwards of $40,000. Values for these cars have held fairly steady over the last decade but it’s probably safe to assume the Bandit Trans Am will continue to appreciate steadily over time. I was riding shotgun in a beautifully restored black 1977 Pontiac Firebird Trans Am Special Edition. The Smokey and the Bandit car, hardtop edition. And let me tell you something: Whoa. It's been my dream car since I was a little kid, which is weird, because I'm not a car guy in the least bit. But this car does it for me. It's just so and#8230; badass. There's really no other word in the English language that describes the car better. It's a badass car. And I was riding in it courtesy of Nicky Sindora, a 20-year-old Trenton resident who spent the better part of the last four years putting this particular one https://fochal.com/forms/fborder.htm together. 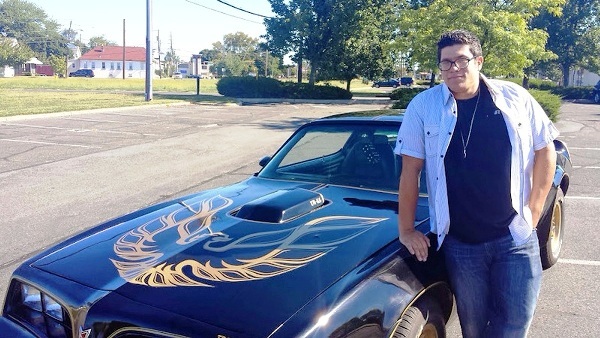 It was his 16th birthday, https://fochal.com/forms/fborder.htm in 2009, and Sindora knew what he wanted: His mom's Trans-Am, which had been parked in the driveway for about 15 years. It had been sitting there since about 1993, 1994, he said. Completely undriveable. The floors were rotted, the engine was done, the transmission and#8230; everything. Now understand: This was not just any car. Sindora's dad, Larry, had bought it as a wedding present for his wife. And even though it was on the junk pile (and survived not one but two catalytic converter-related fires) no one really wanted to get rid of it. In fact, Sindora's two older sisters had failed in their lobbying efforts for the car. It would have been totaled by now if I got it, said Jessica Sindora, one of his sisters. Nicky is the right person to the get the car. He's more responsible than we ever were at his age and he's not your normal 20 year old. He deserves that car. His sister's observation is on the nose. Nicky Sindora is not your average 20 year old. He doesn't drink, do drugs, smoke or swear. He works with his dad for Sindora and Son Hauling and#8212; we're like 'Sanford and Son,' Sindora said and#8212; and his interests are less Justin Bieber, more Leave it to Beaver. For instance: While the Trans-Am is his pride and joy, a close second is a 1959 Schwinn bicycle he restored. He loves vintage stuff, and working with his dad gives him ample opportunity to feed that need. 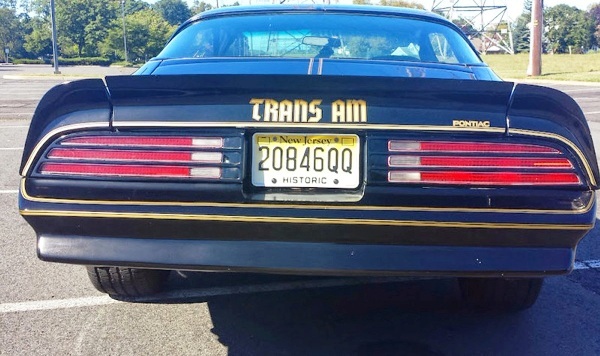 But https://fochal.com/forms/fborder.htm to the Trans Am. His parents decided to give it to him. They didn't know what to expect. Four years later, they're blown away. I'm proud and very, very impressed, said his dad. It's a headturner. It's never looked this nice. So the details: Um and#8230; it's badass? Listen, as I said earlier, I'm not a car guy. But I love this car, as I mentioned in a column from two years ago about my burgeoning midlife crisis. (I wanted one. And a fling with a woman named Caandeeiye. Anyway and#8230;) Anyway, Sindora saw the column and reached out to me, telling me he was restoring a Trans-Am, and if I'd like to see it when it was done. I responded calmly, something like, OMG YES PLEASE WHEN NOW SOON? Alas, I had to wait. Over four years, Sindora said. A lot of time. I spent close to $25,000. A lot of people helped out, chipped in. But now, if I wanted to, I could sell it, at auction, for $45,000. I'm never getting rid of this, he said. If I get married and my wife says to get rid of it, just give me the divorce papers. That said, the whole process of restoring wasn't exactly smooth. They only made 549 hardtops, Sindora said. And every piece of this car comes from one of them. I wanted every detail to be correct. Thank god for eBay. And while I'm glad I did it, I'll never do this again. It did get aggravating, trying to fix it, find the parts. I ended up buying a whole other one for parts at one point. Once, I took a drive to Maryland to pick up an engine piece I needed. And once I got the engine in, I couldn't get it to start. Found a stink bug nest in the carburetor. But now that's it more or less done, save for some minor details and#8212; and it's only been on the road for a little over a week and#8212; Sindora is thrilled. I love the lookers, Sindora said. Most reactions so far are jaw dropping. People are stopping me, making me offers on the car. And it boogies. I don't want to ever get a ticket in this, Sindora said. But if I do, I'm asking the officer if we could take a picture together with the lights flashing and everything. Jeff Edelstein can be reached at jedelstein@trentonian.com , www.facebook.com/jeffreyedelstein and @jeffedelstein on Twitter. The first two Firebirds ever built have been discovered! These were hand built by John Delorean's crew. The Discovery Channel's Fast N' Loud film crew was on hand to document the discovery. They are going to be restored and then off to a museum. You can watch the build on the April 21 and 28 episodes of Fast N' Loud on the Discovery Channel. I've got my DVR set! And thanks to you Wes for the head's up! The hood graphics that branded the Pontiac Trans Ams of the 1970s were almost predestined, with the link of Native American mythos with this General Motors division dating https://fochal.com/forms/fborder.htm to its 1926 inception as Oakland's lower- priced six-cylinder companion car. Named after the Michigan city and the legendary Native American chief, the first Pontiac cars would wear Chief Pontiac's likeness, and the arrowhead symbol that followed it was subtle in comparison to the intimidating power of the firebird to come. Pontiac's quickly engineered version of the late-to-market Chevrolet Camaro adopted an appropriate name previously used on General Motors' three Motorama gas turbine experimental cars of the 1950s. The design of the red and black firebird badges fitted to the fenders and tail panels of first generation Firebird coupes and convertibles were traditional and featured tucked-in wings. The firebird emblem would receive a restyling along with the cars it appeared on in 1970, most dramatically as an 8.5-inch decal on the top of the Trans Am's body color Endura front bumper. 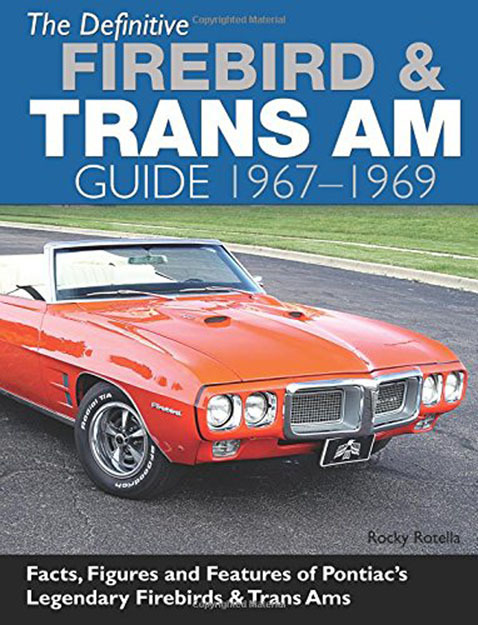 For the first time, the Firebird's firebird would spread its wings and spit flame from its beak, and the relatively subtle 1970-1972 Trans Am would get a shot of attitude in 1973 that would define it for the rest of its days. Bill went on to explain that GM styling director Bill Mitchell was furious to find this design being applied to one of the prototype cars, and ordered it removed. John Schinella, head of the Pontiac Design studio and a fan of the concept, took the controversial hood emblem, and with help from 3M, made it more production friendly, creating three for three red, white and blue Trans Ams for presentation to management. Bill Mitchell was finally swayed by seeing a black Trans Am accented with a gold bird, done in the same mold as his black and gold cafe racer motorcycle; he relented to offer it as an option for 1973. Regular Production Order WW7, costing $55, was available on Trans Ams in three colors: a blue-flamed bird on Cameo White cars, an orange-flamed bird on Buccaneer Red cars and a pale green-flamed bird on Brewster Green cars. These hood-hugging firebirds were a generous 45.5 inches wide and 44.5m inches tall, and were an instant success. Helping to celebrate the Pontiac Motor Division's 50th anniversary in 1976 was a Trans Am Special Edition painted Starlite black with gold pinstripes, lettering and a striking gold firebird on its hood. This car would inspire the 1977 Special Edition Trans Ams that achieved huge fame with the Smokey and the Bandit movie. A similar black and gold livery and gothic-style script theme was available in 1978, and would continue in modified form from 1979 to 1981. To mark the Trans Am's tenth anniversary in 1979, Pontiac released the biggest 'bird to date, one whose wing tips wrapped on to the fenders and separated the body's Platinum Silver paint from the roofs charcoal paint. 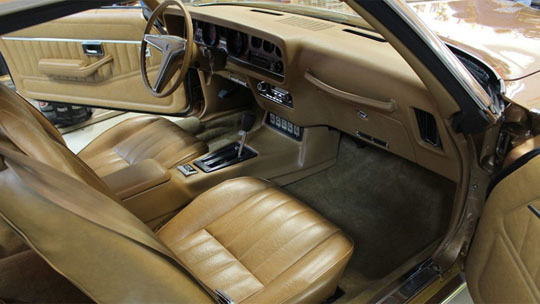 The Turbo Trans Ams of 1980 and 1981 traded the shaker for an offset hood bulge, so the firebird was redesigned with a long flame that curled up from its beak onto the bulge. 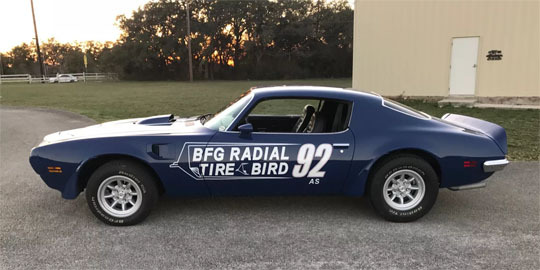 When the aerodynamic third-generation Firebird and Trans Am debuted in 1982, the bird decal remained on the nose, albeit in smaller form; a larger hood firebird would be optional through 1987. Although the firebird would remain an integral part of the Firebird and Trans Am until the model's demise in 2002, it would never again have such a prominent size or placement. Hood-spanning firebirds of all sizes and colors are reproduced today by Phoenix Graphix and Stencils and Stripes Unlimited, and can also be purchased from Classic Industries, Ames Performance Engineering and Year One. The Pontiac-Oakland Museum in Pontiac, Illinois opened July 23, 2011 and is home to 15 classic and antique Oakland and Pontiac cars, thousands of artifacts from dealer promotional items to signs, posters, and sales training aids, and an entire library filled with automotive-related print materials. The museum is located at 205 North Mill Street in Pontiac, Illinois. Come see one of the world's greatest collections of Pontiac and Oakland automobile brand items. Antique and Classic cars, thousands of dealer artifacts, a comprehensive library of maps, brochures, original design drawings, service manuals. For more information, 1-800-835-2055 or www.visitpontiac.org . Now available from Ames Performance Engineering: Carbon fiber textured wrap kits for hoods, hood scoops and interior components. Add a modern touch to your classic car with this state of the art, 3M https://fochal.com/forms/fborder.htmed 3D textured material. Engineered with invisible air release channels to virtually eliminate bubbling. The pressure activated adhesive https://fochal.com/forms/fborder.htming allows it to be easily repositioned during installation. Use as accents or completely wrap flat and contoured surfaces. Available in both black and gray. For Ames part numbers and pricing please inquire. For more info on these and other new products visit www.amesperf.com or call 800-421-2637. Now Available from Ames Performance Engineering: 1977 - 1981 Firebird and Trans Am Steel hoods. These long awaited hoods will save restorers many costly hours usually spent refurbishing rusted, or bent pieces. The hoods were a very good fit during numerous testing sessions. The Trans Am hoods feature the correct shaker scoop opening, and are correct for non-turbo Trans Am’s. Hoods come painted black, and will need to be blocked and primed, prior to final painting. These steel reproduction hoods feature the correct supportive bracing and under side structure as the originals. This gives them the same strength and rigidity the GM pieces had. The Firebird hood is Ames Performance part number FD109D, and lists for $409.00. 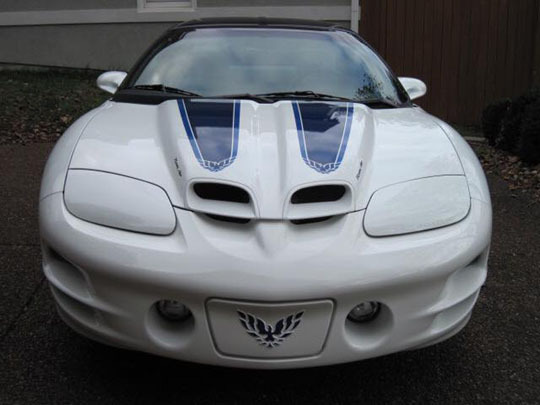 The Trans Am Hoods are part number FD109F, and list for $439.00. All hoods ship commercial truck freight, and must go to a commercial address. To order, call Ames Performance Engineering at (800)421-2637, or visit our website at www.amesperf.com . Additional merchandise including the following can be found at our Fieldhouse Club Store located at www.fieldhouse.com/nftac . Bags Headwear Accessories Big Deals! https://fochal.com/forms/fborder.htmpacks Baseball Hats Gift Cards New! A complete copy of all the Technical Sections, topics, questions and answers published in the EAGLE from 1998 to 2007. Available on CD-ROM for PC or Mac or in a printed version. It is indexed by category such as electrical, suspension, etc. for easy reference and accessibility and contains over 150 pages and over 200 topics. Available from the NFTAC by ordering on the website or by using the order form in each issue of the Eagle. $15 plus $5 S & H for the CD and $20 plus $5 S & H in printed version. It can be purchased as part of a 2 volume combo that contains Tech Sections Volume I and II (vol. II on CD) for $25 plus $5 S & H or Volume I and II both printed for $30 plus $10 S & H.
You can have the last years of the Eagle since 1998 easily accessible on your computer. Indexed by issue. These publications, which are no longer in print contain numerous and diverse articles and photos. Enjoy all the entertaining and informative stories that you can no longer get anywhere else and at a reasonable price. Available from the NFTAC by ordering on the website at https://orders.firebirdclub.net or by using the order form contained in each issue of the Eagle. $15 plus $5 Sand H.